Communism is both deeply hated and deeply loved by many. But whatever your thoughts are on the ideology it’s still easy to get fascinated by the phenomena. In its essence the ideology strives towards a utopic and equal society without classes and without private ownership. It’s safe to say that communism is not strong today. It is an ideology of the 20th century during which many countries held it as the only possible way of life. However, no country succeeded in realizing the utopic society. Way to often these countries got stuck in the proletarian dictatorship with limitations in freedom of speech and terrible prosecutions ending in mass murder of opponents in countries like the USSR and China. The enemy of communism is of course capitalism. This we saw during the long conflict that was the cold war which fueled wars all over the world. Now, what would be a stronger symbol of capitalism if not money itself? There is something hypocritical with communist symbols and leaders on the very same thing that de ideology strives to counter. But the communism that was created in different countries during the 20th century is not unfamiliar to creating cults around certain figures. Some leaders got almost a religious status in these secular countries. The personality cult of the communistic countries works actually esthetically very well together with the classical design of banknotes. This fact makes them especially fun to collect. In a couple of posts I’ll present some examples of these banknotes from my personal collection. You’ll get to read about them in an order of when the different persons were active. We’ll start it of where communism began. 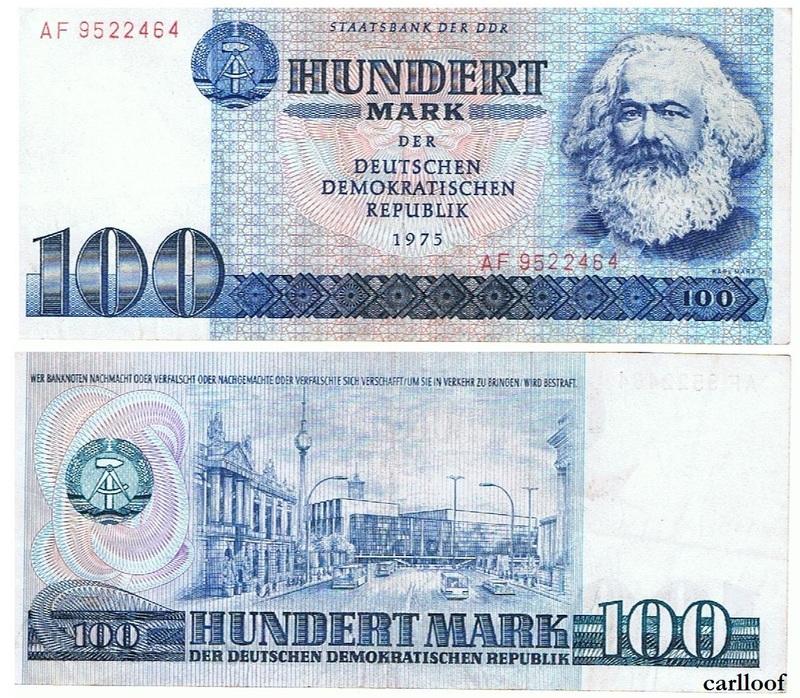 Above is a 100 mark banknote from East Germany (DDR) and it features Karl Marx, the philosopher and sociologist that could be considered the founder of modern socialist and communism. Below you have another banknote from DDR. This is a 50 mark banknote and it features Marx companion, Freidrich Engels. Together they laid the basis of the ideology with The Communist Manifesto which is their most famous manuscript and one of the world’s most influential ones. 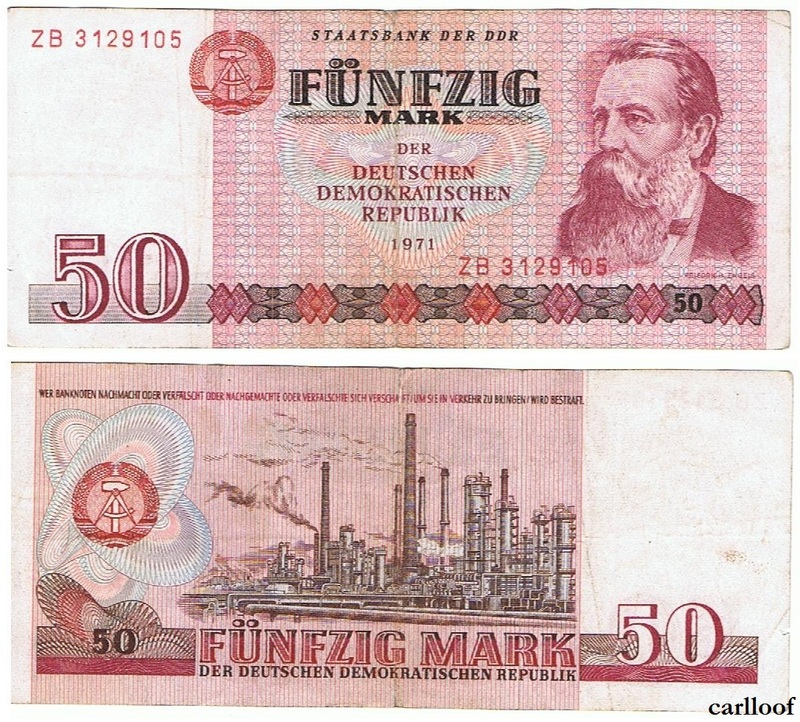 It’s no wonder that Marx and Engels were featured on DDR’s highest valued banknotes. DDR was a socialistic state and both of them were from Germany. The back of the 100 mark banknote features a couple of buildings in East Berlin. Among them you have the Palast der Republik (the parliament at that time), the Berlin TV tower and the red city hall. On the back of the 50 mark banknote you have an industrial complex portraying the importance of heavy industry for the state. These were my two first communist banknotes and there are six more to go!